PUBG Mobile has finally reached Android & iOS devices. If you downloaded the game, it’s time to go into the battle. But, do you know what you have to do to win the game? In this post, we’ll show you some small tips and tricks to help you survive and eliminate your rivals. It’s never easy with a new game when needing to survive when everyone’s out, but you could keep these tips to help you get a good start on the PUBG Mobile. Everyone else also wants loot and always tries to kill you. You should aim to land down near buildings to grab the loot, but remember to avoid the most popular ones as your enemies are there. You are now in the battle and you don’t want to be the loser. Your first priority upon landing should be to loot. Once you followed the tips to drop near a building away from enemies, now try to get indoors and loot up. A weapon must be the first priority. The second one is the body armor as well as the healing items to keep you alive. After choosing your weapons and other items, you can then start thinking of which weapons is the most compatible with you as you discover other areas and take down the enemies. Playing action games on a touchscreen might be a little more convenient, as you can use the auto functions to make it easier. You should take advantage of them. Auto sprint: when you’re running you will see this icon. Just hover over it with your finger and continue running without having to hold down. Free look: drag around the small eye icon below the map to take a look around. You can do this while you’re running so you will be able to look around you without having to change the direction. 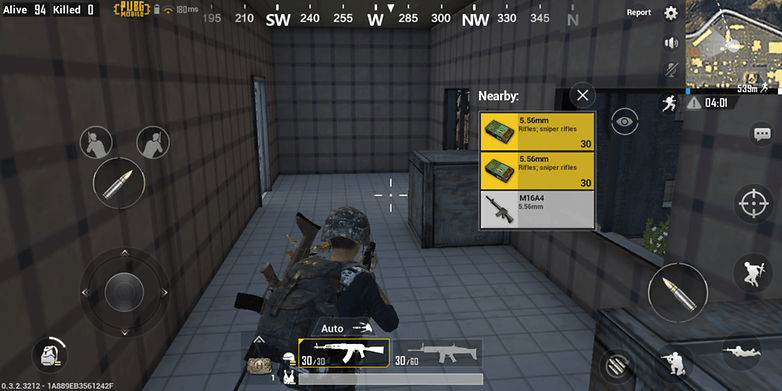 Auto loot: The essential items like rare scopes, weapons, armor will display in the form of icons, so simply tap on them to pick up. If you fire wildly, it will waste your shots and even alert others your enemies. 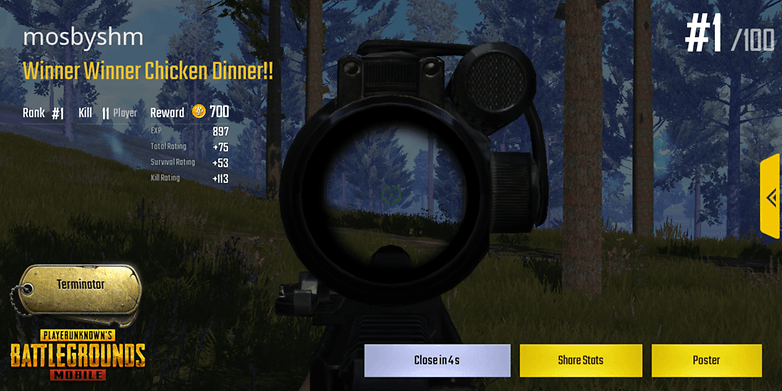 In PUBG Mobile, you should know that most of the shots are not firing at you accurately, so you can stop and aim to shoot enemies. Tap on the small crosshair icon locating at the right screen and then drag around to aim. If both aiming and shooting are awkward, so head to the settings to toggle on an extra fire button on the left. So, you can choose whichever is faster for you. 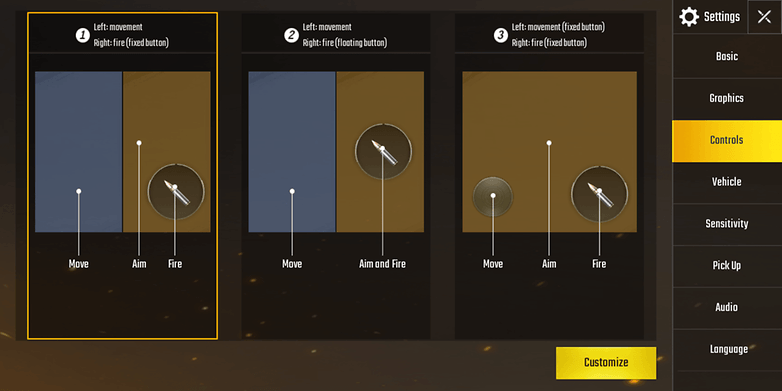 In PUBG Mobile version, if you are a wise warrior, you should usually adjust the settings to be compatible with your scenarios. The game comes with various settings in the options without notifications, but just with a few slight tweaks, you could win the battle. If the game is running slowly, you should set the graphics settings to low to experience the game more smoothly. If you want a fast option, a car means the best choice for you. Once you found cars, you should note when the walls close in. Some players give priority to dropping near cars instead of the weapons. If you’re repeatedly dropped in free-for-all, then you should know playing some squad games to improve your skills, especially when you have friends to participate in a team. Teamwork, with the better-skilled players, will be less intensive and you will have more breathing rooms.